We're a wildlife-loving family. My kids have grown up around wildlife and are fascinated by animals and wild places. 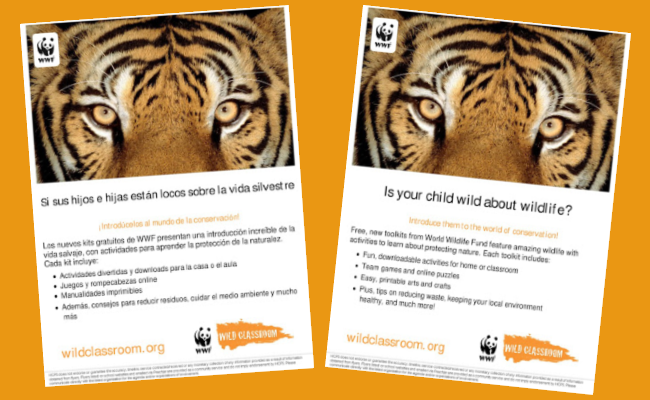 So I was delighted when my friend told me about the new online classroom from World Wildlife Fund. 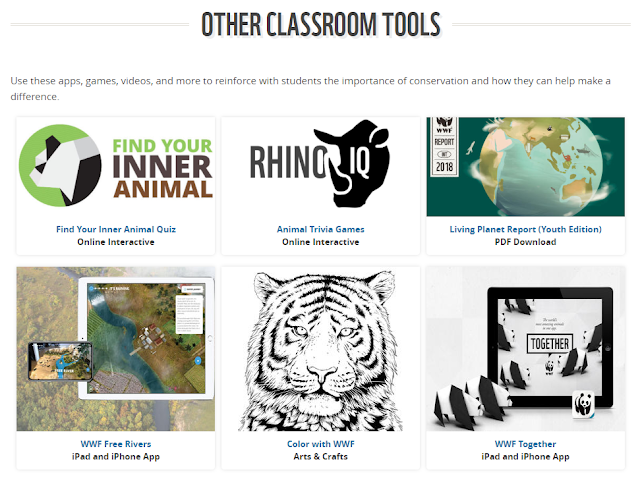 WWF's Wild Classroom is a great tool for teachers. What child doesn't enjoy learning about wildlife? And if you're going to study wild creatures, you might as well teach them the message of conservation, too. You have the option of downloading the entire toolkit, or you can see what's inside. 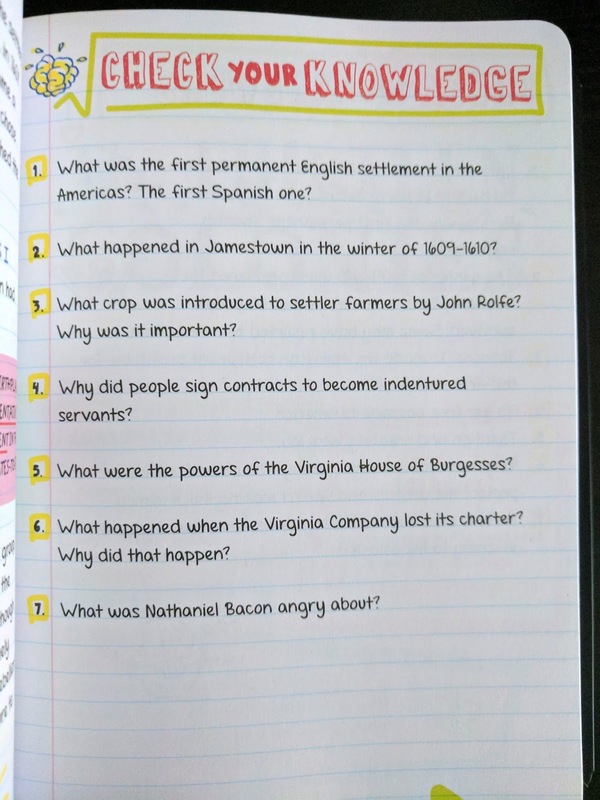 If you choose the latter, then you can see the individual lessons in each subject (such as science, STEM, social studies, language arts, etc.) 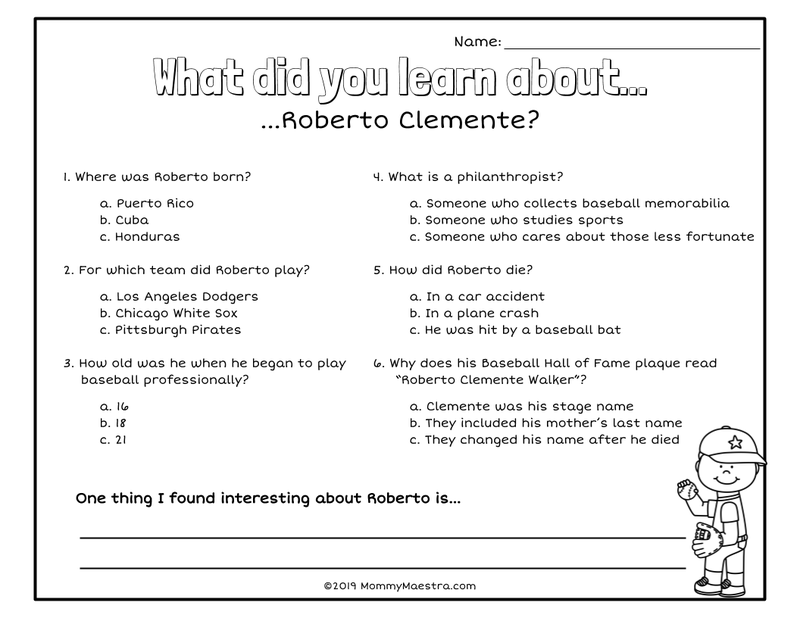 plus classroom posters to download. Each lesson also contains an activity for the students to complete. Unfortunately, even though I received a Spanish flyer about the website, I could not find an actual Spanish website anywhere. But for my readers who teach classes in English, this is a lovely discovery and a great tool for you to use with your children while teaching them the concept of conservation! Yay! Who's excited? I'm excited! Ooo! 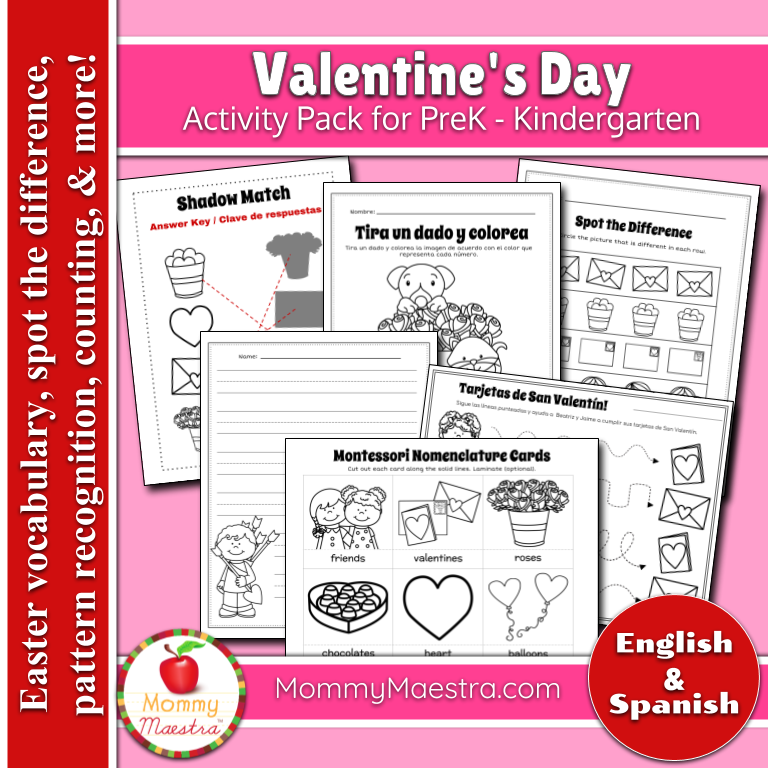 Today, I have a wonderful treat for those of you who are seeking beginning readers in Spanish for your children. A few weeks ago, an author reached out to me asking me to take a look at her new series in Spanish for children. I agreed and received the most adorable books! I'm ALWAYS being asked about early readers in Spanish and where can people find them. So this series is especially helpful. 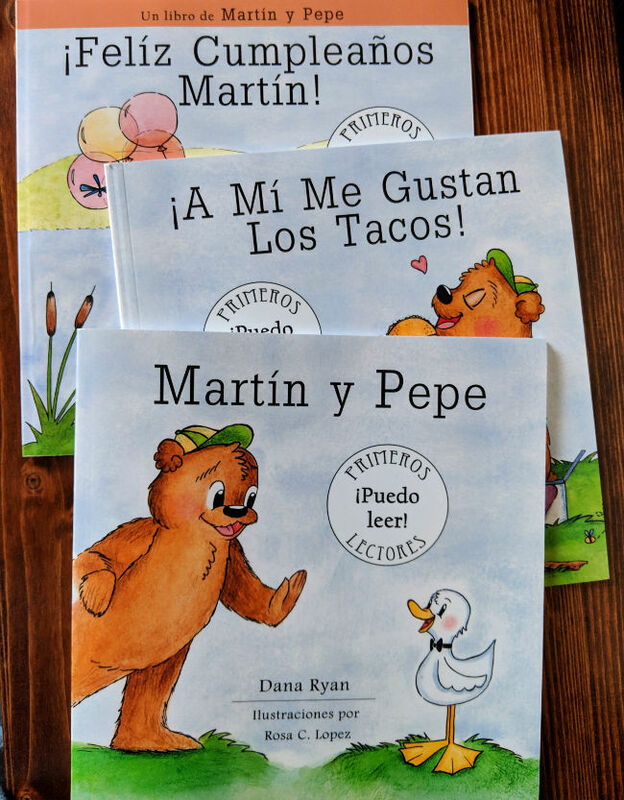 The Martín y Pepe series was created specifically for children learning to read in Spanish. These primeros lectores all center around the relationship and experiences of two characters. Martín is a sweet little duck who has just met Pepe, a caring, loveable bear. 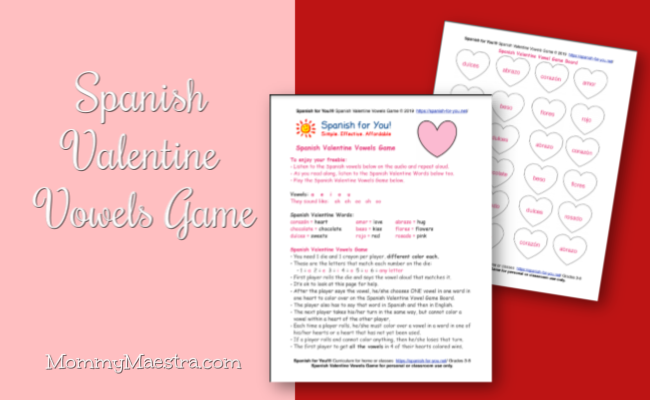 Dana, the author, worked closely with her child's school as she created this series (two of her kids attend a Spanish immersion school). And her work reflects her careful attention to detail. The books themselves contain simple vocabulary and include high-frequency words (palabras de uso frecuente) needed for comprehension and fluency. 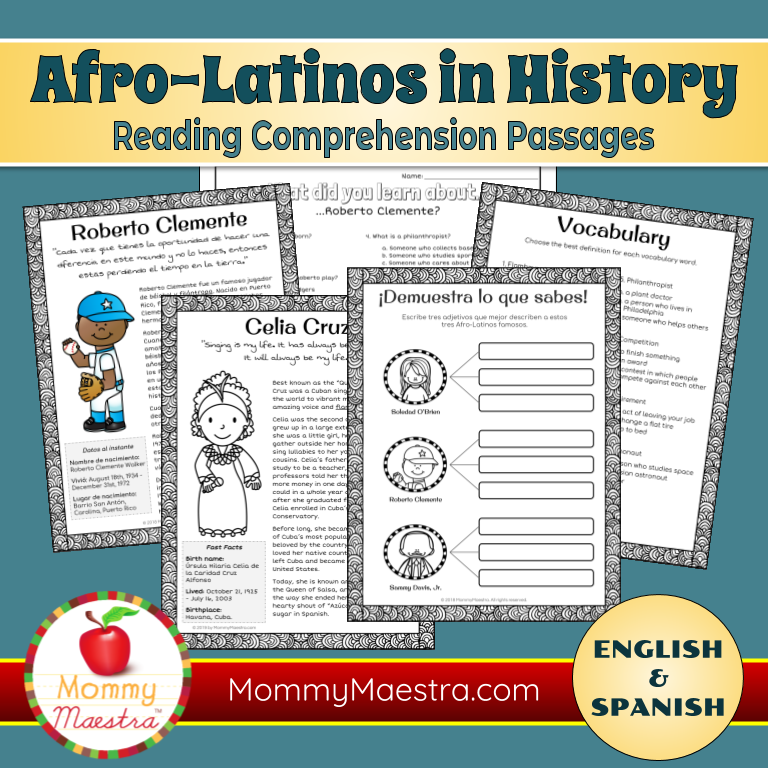 She says she decided to write these stories after her children stopped wanting to read in Spanish after having achieved a certain level of literacy. She said that many of the early readers she was finding felt didactic and did not tell a story. So she tried to create what she and her children wanted. 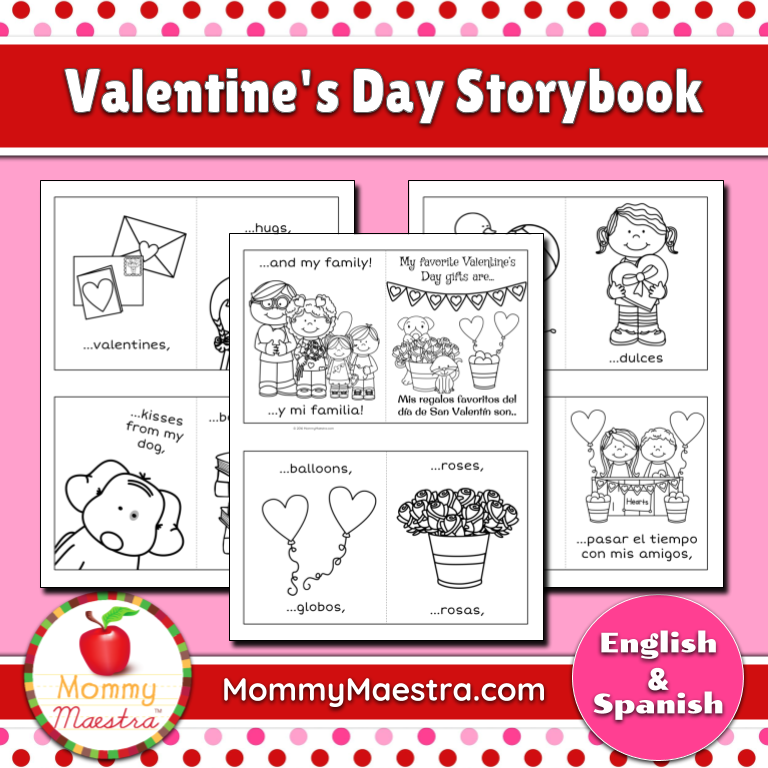 The first book, Martín y Pepe (aff link), covers all vowel sounds and includes the following high-frequency words: yo, soy, un, y, este. In this storyline, the two characters meet each other for the first time and become friends. 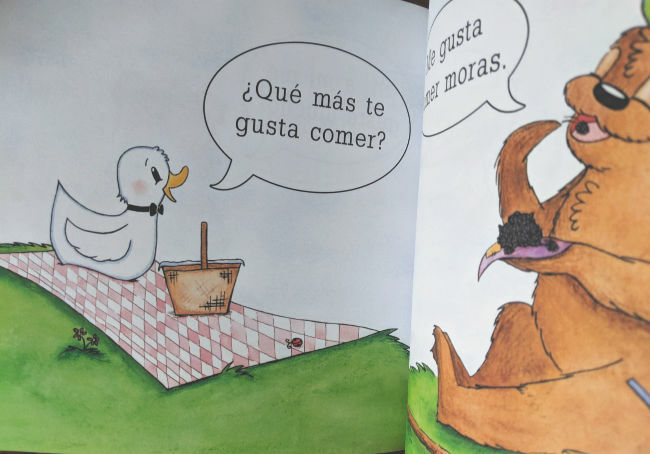 The second book, ¡A Mí Me Gustan Los Tacos!, focuses on the “m” sound, repeats the phrase “a mí me gusta,” and includes the high-frequency words: yo, un, y, que, gusta. This might be my favorite of the three simply because Pepe is telling Martín about all the foods he loves to eat and ends with his favorite: TACOS (which may or may not also happen to be my favorite)! I think children will love this book, too, and you can use it as an introduction to getting your kids to talk (in Spanish) about all the foods they love, too. The third book, ¡Felíz Cumpleaños Martín!, focuses on the “g” sound, repeats the phrase “yo tengo” and includes the high frequency words (palabras de uso frecuente): yo, la, una, es, y, que, por, gusta, para, tengo, también, nuevo, pero. In this sweet story, Pepe is celebrating Martín's birthday. Follow this series on Facebook! 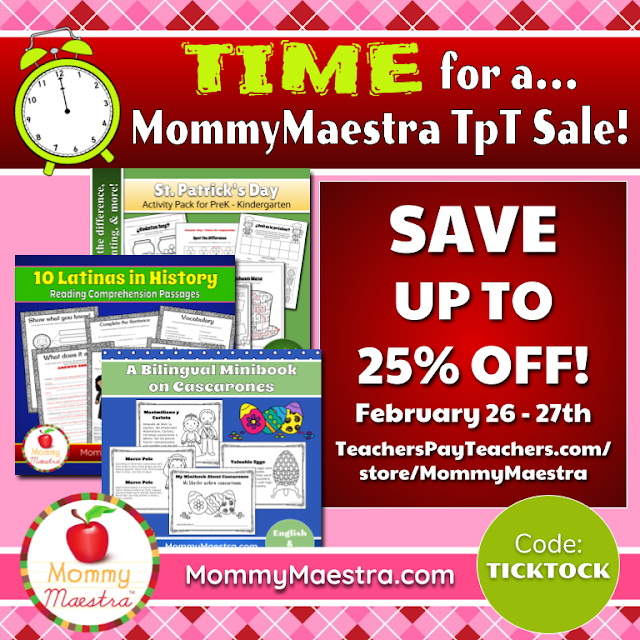 Homeschoolers! 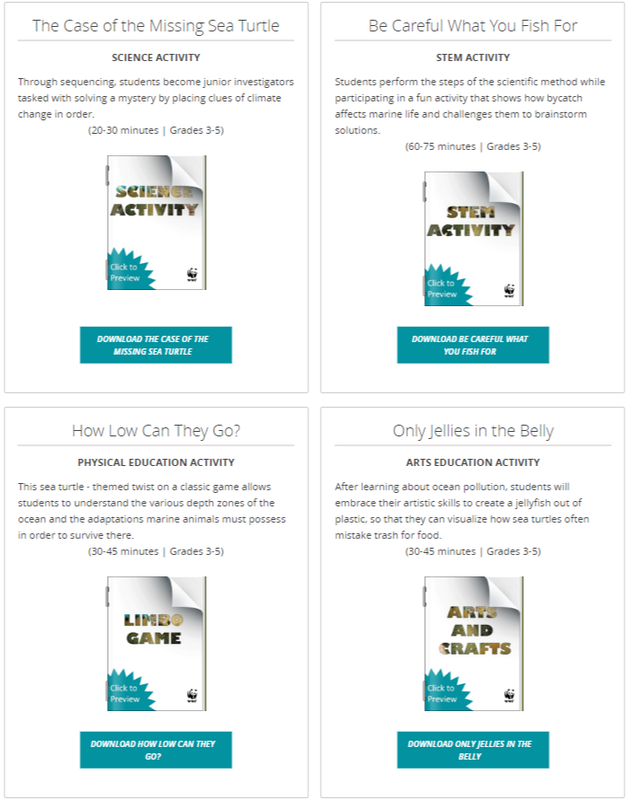 Do you know about Rick Steves' website for educators? 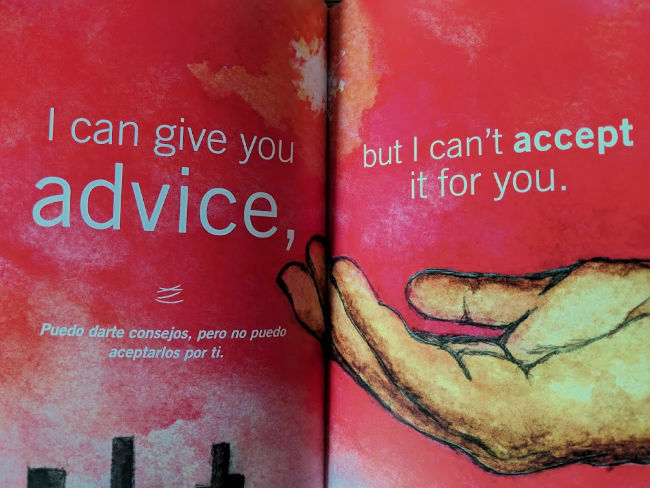 I am so grateful MommyMaestra reader, Mireya, for sharing this with me! and visit a vibrant market in the south of France. 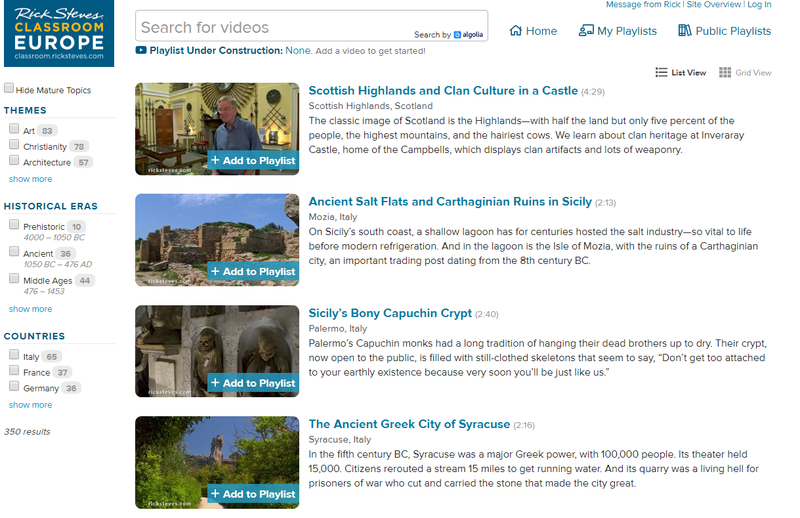 The video clips are totally searchable by keyword and you can filter your search by city, country, historical era, and theme. 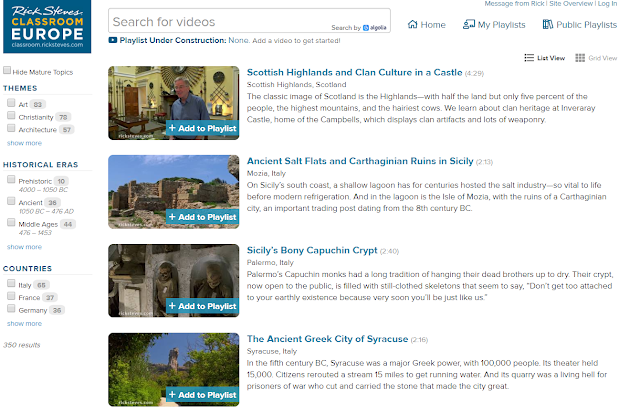 **And you'll also love the fact that you can filter out any video clips with mature content. 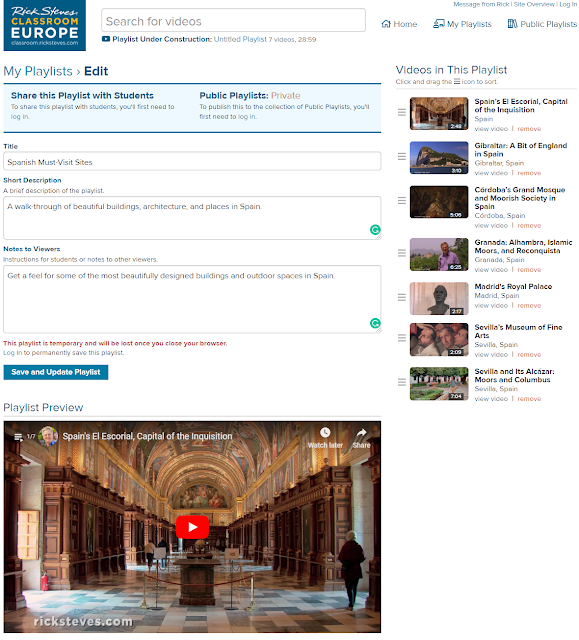 Another awesome feature is that you can create your own temporary playlist and look through other public playlists that have been created and shared. Or, if you sign up for a free account, then you can create multiple playlists and save them for future use and share them with your students or publish them publicly to share with others. I made a temporary playlist on beautiful buildings and places in Spain. Really, this is a fabulous tool to use in your classroom or lessons. 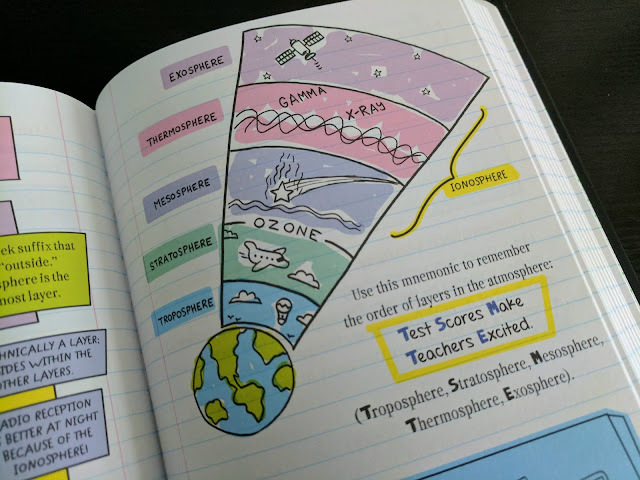 There's tons of information contained in each segment with great visuals, too. It's like visiting Europe from your classroom with your own tour guide! Are you interested? Then click here to visit Rick Steves Classroom Europe. Over the last year or so, I've been watching with a mixture of awe, surprise, and immense respect as young people - especially teenagers - across the country have discovered their voices and started to use them on a national stage. They are realizing that they have power in numbers and that their thoughts and opinions matter. They are becoming activists and changemakers demanding social reform. I'm amazed because I think most children and young adults have trouble finding their own voice. The tween and teen years are such difficult ones, especially for young girls who really struggle with self-confidence and doubt. My own daughter entered high school this year. I watched her go from a self-confident, outspoken person to one who filled with self-doubt and a wavering self-image. It was a shock for me as a parent, who wanted to nurture her independent and self-assured personality. 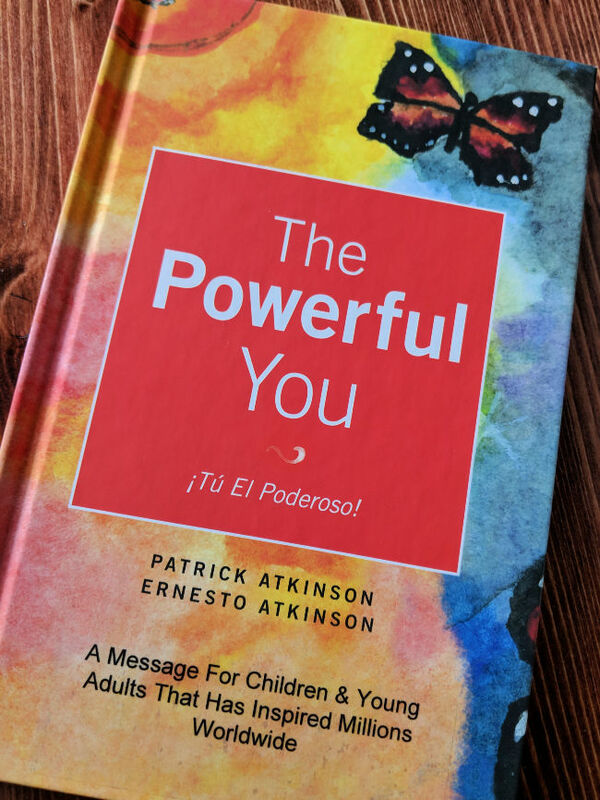 That's why when I was asked to share the book, The Powerful You/¡Tú El Poderoso! 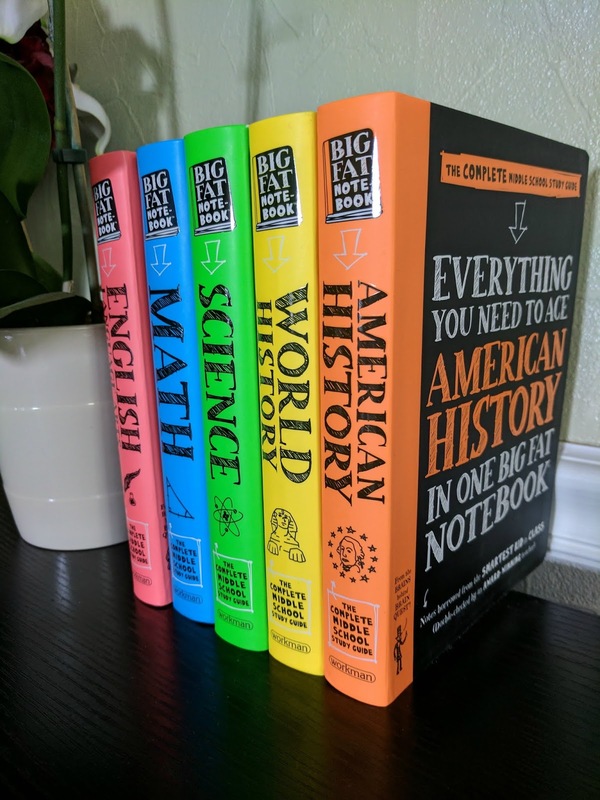 (aff link), I immediately said, "Send me the book so that I can take a look." And I'm so glad I did. I can't tell you how reading this book for the first time affected me. It truly does say exactly what I want all of my children to know. It is beautiful and empowering and expresses what I think most parents want to teach their children, even if they don't realize it consciously. I can give you life, but I can't live it for you. I can teach you the difference between good and bad, but I can't make the decision for you. 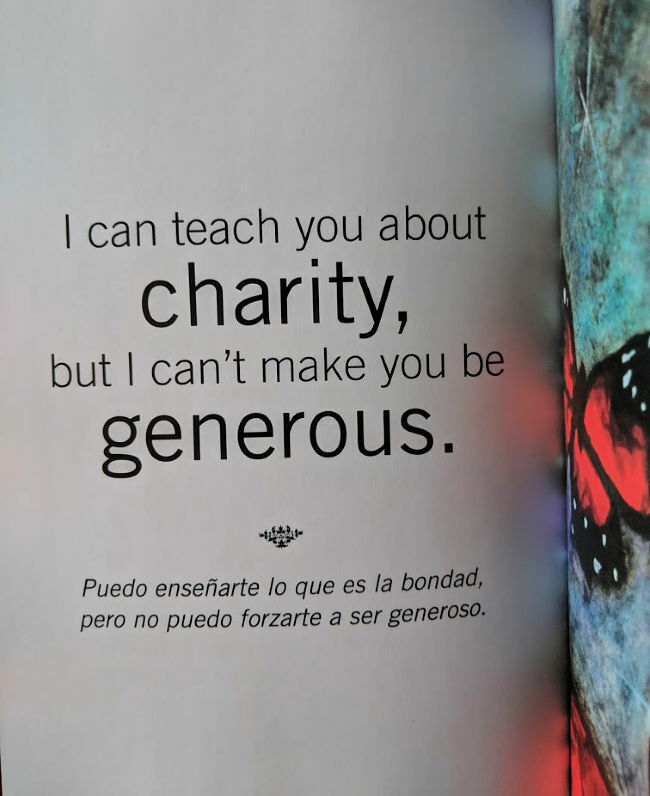 I can teach you about charity, but I can't make you be generous. I can give you liberty, but I can't help you to protect it. You can't help but put down this book with a totally new perspective. It is loving and inspirational all at once teaching the reader that parents can provide us with all the tools they possess to help us through life, but ultimately, our life's path is determined by our own choices and whether or not we are wise enough to learn and use the tools our parents give us. Communication between parents and teens is frequently difficult and (in some cases) very limited. Sometimes the relationship has become too strained. And some parents cannot put into words what they wish to convey to their children. This book is a wonderful tool to facilitate these conversations. I think it would be a beautiful birthday book for every teen or tween. I love it so much, I've decided to buy two more copies so that each of my children can have their own copy when they are old enough to receive the important message of empowerment and taking responsibility for your own actions. And the added bonus that just puts this book over the top is that it is completely bilingual with full text in both English AND Spanish! I wish I could put a copy of this book in the hands of children everywhere. I wish it were required reading in school. 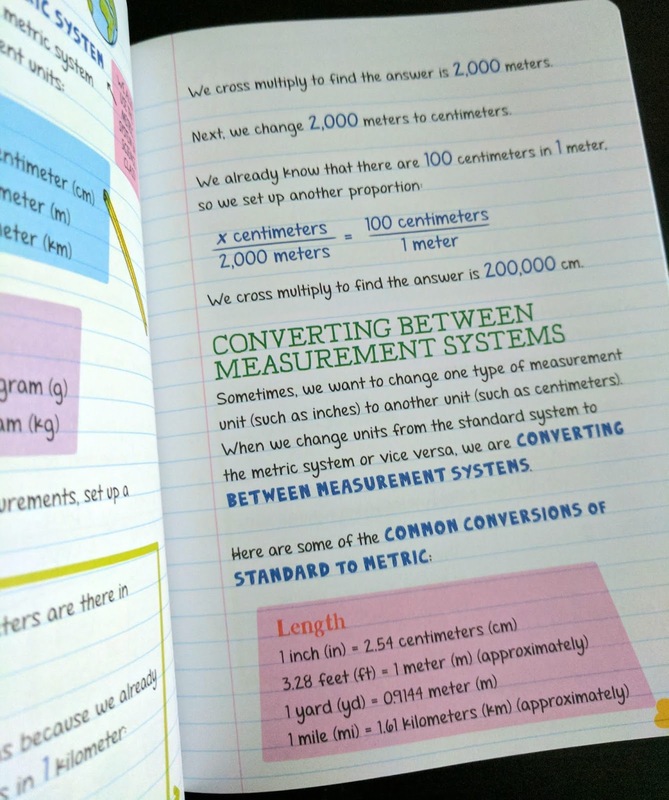 The book was written and illustrated by a father-son team. I was reading about them and it made me even more determined to share this with MommyMaestra readers. the ‘Institute for Trafficked, Exploited & Missing Persons’(ITEMP), one of the United States’ first contemporary anti-human trafficking groups. and The GOD’S CHILD Project, which is a nonpolitical international humanitarian organization that develops and administers health, education, family foster care, community development, and human rights protection systems in the world’s poorest nations. He has been knighted by the Spanish Legion(!) and has received numerous international awards in recognition of his dedication to human rights. And he's even the subject of the book: The Dream Maker by Monica Hannan. You can read more about his incredible life here. Patrick's son, Ernesto "Neto" Atkinson, is the illustrator of this book. The illustrations are beautiful and complement the message very well. I was pleased to also see a bit of Hispanic culture reflected in at least one of the illustrations when I recognized a resplendent quetzal (found in Guatemala and several other Central American countries) flying across a page. Neto has a Masters in Art Therapy from the School of the Art Institute of Chicago. He's been described as an "artist who truly sees art as an active agent of change." I can see that he has learned the essential lessons his father describes in this book and has applied them to his own life to make a difference in the lives of others. 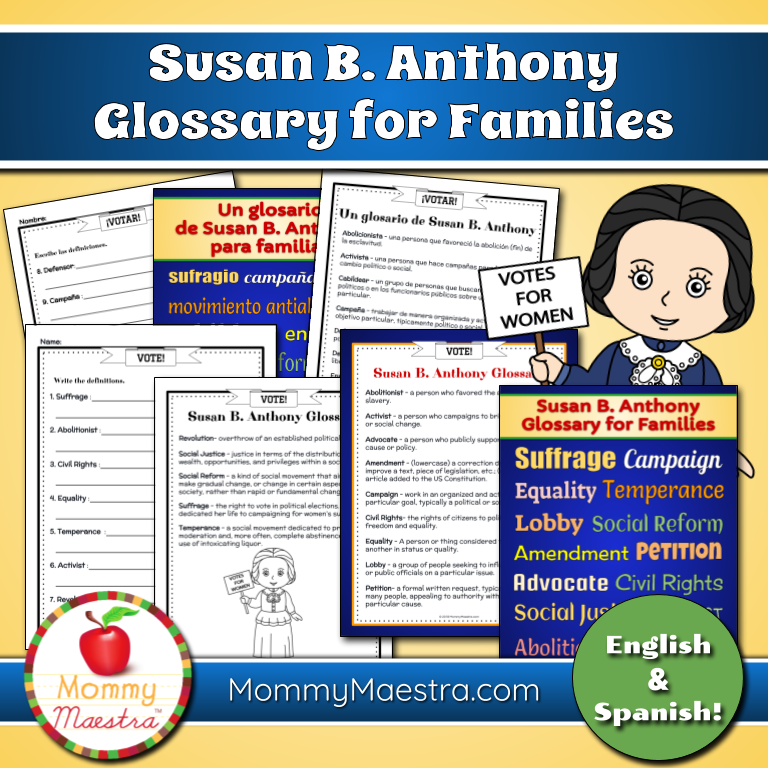 How familiar are you with Susan B. Anthony? I ask because tomorrow is her birthday. 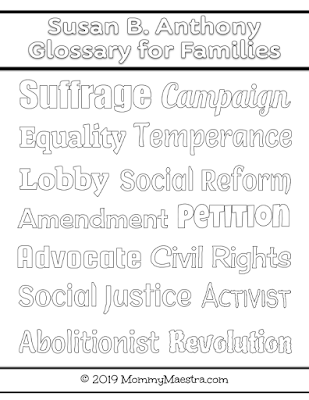 She is one of the best-known suffragist leaders, who worked tirelessly her whole life to make it possible for women to vote. I just wrote an article for Woo! Jr. about Susan B. Anthony's life. She was really remarkable. So in honor of her birthday, I have a gift for all of you. 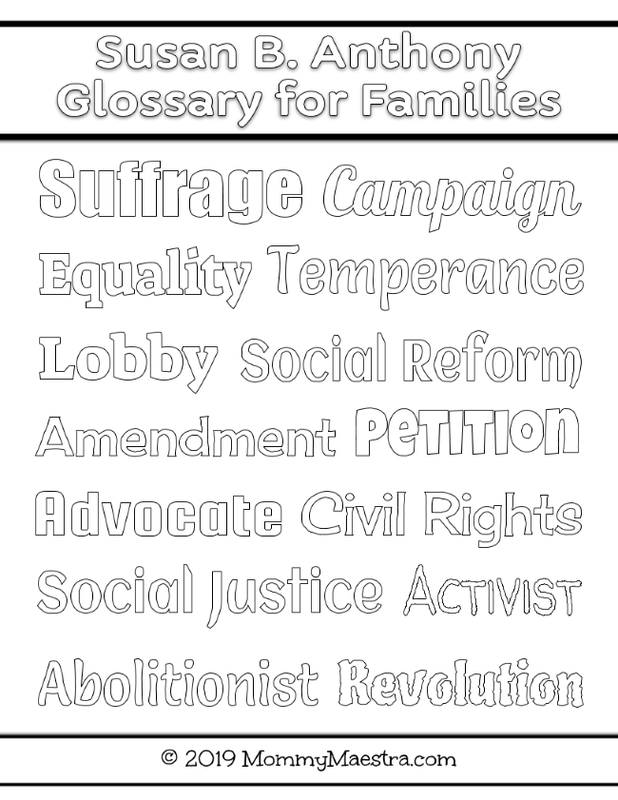 Today and tomorrow only, you can download this new glossary I created with words related to her.